I have seen three U.S. presidents in person in my lifetime. At the age of three, in 1960, I distinctly remember seeing John Kennedy when my father took me with him to see the future president during a brief campaign stopover at our local airport. Even at such a young age, I somehow knew that this was an important event, one that I should remember. While my encounter with JFK is certainly an early memory, I have often wondered which of my many childhood memories is the earliest. A memory that predates even the Kennedy episode was made in—I have to believe—about 1958 or 1959; it is probably my earliest. I remember riding in a small wire basket on the handle bars of a bicycle on Mackinac Island, Michigan. I must have been an infant at the time. I remember one particular location on the island: Arch Rock. Whenever I have returned to that spot over the years, the memory of that ride in the wire bicycle basket is vividly brought back to me. A parent would probably be arrested today—or at least given a stern lecture—for carrying an infant in a bicycle basket. But times were different back in 1950s and ’60s. Even when we brought our oldest child home from the hospital after her birth in 1981, my wife just carried our newborn in her arms in the front seat of our car. I don’t think child car seats had been invented then, or at least they weren’t widely used; they certainly weren’t required by law. But now I digress. 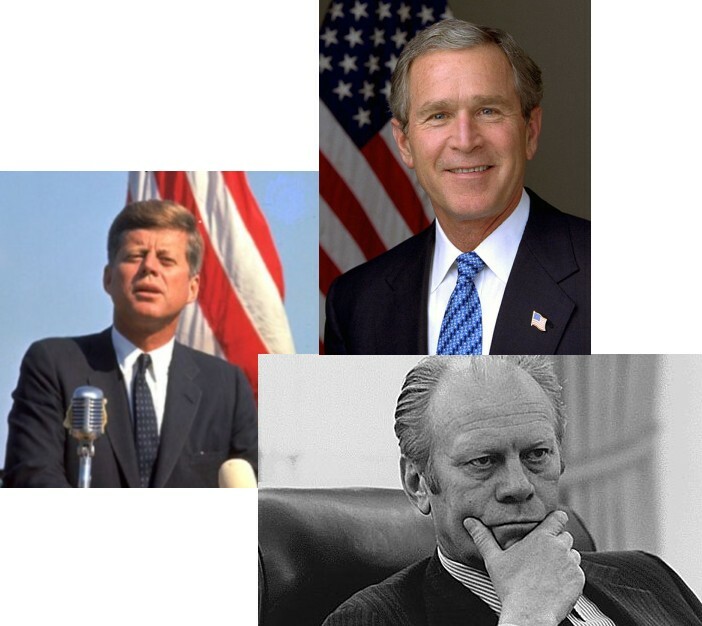 Another president that I saw in person was Gerald Ford, sometime around his failed election bid in 1976. President Ford flew into the Grand Rapids, Michigan, airport—now named the “Gerald R. Ford International Airport”—on a campaign trip back to his home town. My future wife and I decided to go see him arrive. We were at the airport a couple of hours early and found a spot right up on the fence, figuring that we might have a chance to shake his hand if he came up to the fence. About twenty minutes before he arrived, several dozen VIPs were escorted out onto the tarmac and stationed squarely in front of us inside the fence. That move on the part of the local political operatives effectively placed us at the back of the crowd—in the section reserved for the peasants, as it were. Of course, this all took place before I knew how politics really works. Now I realize that you generally need to “buy” access to politicians to get anything more from them than lip-service-from-a-distance. When George W. Bush came through Grand Haven, Michigan, in 2004, I was along the route, positioning myself about half-way through town. I still have the little flag that I waved and the newspaper article with photos of the day. I wanted to make up a shadow box display of this, but have so far never gotten around to it. If one wanted to pay several hundred dollars, he could have been treated to a luncheon and a few remarks by the president in Muskegon, Michigan, before Mr. Bush set out that day on his bus trip to points south. However, I cast my lot with the serfs and saw him just briefly—in the stairwell of his motor coach—as he passed. There were several other identical motor coaches that were part of the motorcade; the others were doubtless decoys intended to confound any would-be attacker. When finally I spotted the president, it was certainly quite a thrill; it is today a memory etched deeply and permanently in my mind, as are the memories of Gerald Ford, and JFK, and a ride in a wire bicycle basket from all of those years back. Down here in Argentina they carry the whole family on the moped: dad, mom with infant in arms, little kid squished in. I love it! It is sort of scary though to see a car go past with the kid’s head sticking out the window ’cause he’s sitting on mom’s lap–in the front seat! Kids are loved here, cherished–but not so wholly protected from any and all harm.